Pitaara is a brand which makes hand-painted trunks that have been given a modern twist by a sister-duo in Mumbai. Sisters, Megha and Shikha grew up in a Marwari home surrounded by beautiful trunks – some filled with old books, a few with their mother’s saris and some just for show. With that, they found a love of trunks and started their own brand. Under the label Pitaara, they have modernised the old trunk by adding elements of funk to it. 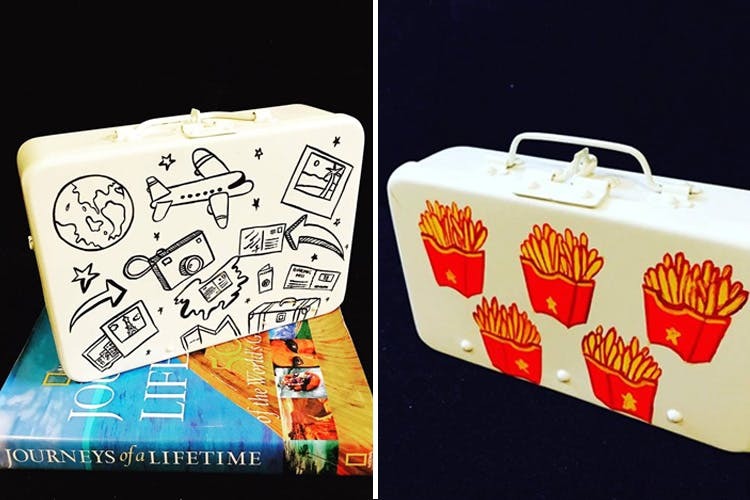 They take trunks of all sizes and handpaint quirky motifs such as French fries, hot air balloons, vintage cars, books, and many more. The smallest trunk comes as a clutch for you to slip a lipstick and your phone into, a medium one the size of an ipad to wear as a sling bag, and even a large traditional sized trunk to use for storage or as a home décor piece. Each of these smaller trunks come with a velvet lining inside the trunk as well as an attachable leather strap for a sling. A small clutch-sized trunk is for INR 2,500, a sling bag is for INR 3,500 and the prices go upward as the size increases.